automatic recreation, but by doing significant forms of work, unprofitable or technically impossible under mass production: work dependent upon special skill, knowledge, aesthetic sense. The do-it-yourself movement prematurely got bogged down in an attempt to sell still more machines; but its slogan pointed in the right direction, provided we still have a self to do it with. The glut of motor cars that is now destroying our cities can be coped with only if we redesign our cities to make fuller use of a more efficient human agent: the walker. Even in childbirth, the emphasis is already happily shifting from an officious, often lethal, authoritarian procedure, centered in hospital routine, to a more human mode, which restores initiative to the mother and to the body’s natural rhythm”. Museums and Heritage Sites increasingly offer mobile guides and Apps to encourage people to use their smartphones and tablet computers for the exploration of exhibitions, outdoor spaces and buildings. These Mobile Apps provide information in multimedia formats, text, pictures and video-clips. They sometimes also allow people to play games and send emails. In this short article we discuss two examples to highlight some of the opportunities and challenges offered by Mobile Apps. The information delivered by these apps can draw people’s attention to particular exhibit features, make visible aspects of objects and artifacts that are invisible, hidden or have disappeared over time. Pictures and text shown by mobile guides, such as the ‘Formative Histories Walking App‘, designed by academics at the University of Melbourne, allow people to compare the architectural reality in front of them with information on the device. This juxtaposition of material reality and virtual reality aims to stimulate interest in the architecture and urban history of Melbourne, and provides the basis for people’s sustained engagement with buildings that they might walk past without noticing or appreciating. The ‘Formative Histories Walking App’ has been designed as part of a project at the University of Melbourne, carried out by the authors, to explore novel ways to engage students with architectural history. In this case, the Mobile App was used as a teaching and learning tool that presented rich visual and oral information on an iPod Touch. Like a human guide, the App takes students on a two-hour walk along Collins Street, a prominent central city axis in Melbourne; the walk involves twenty stops at significant buildings from the nineteenth and early twentieth century. Using a map and menu on the iPod Touch users explore the street and find and examine architectural features in light of the information displayed by the Mobile App. This information is comprised of short text and audio summaries at each stop and a limited number of images that elaborate on aspects such as key buildings set in their historical context, comparative architectural examples from international architects or details of buildings that are not readily visible for the students. In this sense, the information delivered by the app replicates a slideshow similar to those architecture students experience in the classroom; pictures of objects nearby are juxtaposed with objects from different periods or by other architects and designers. the human guide model: these guide direct people’s exploration of a site with an identifiable guiding voice or presence on a predefined route. A number of stops are planned into the route where visitors are given information about an exhibit, building, plant, etc. the interactive exhibition model: these guides offer a wealth of content in various forms that visitors can use to interpret and features of a site. The route does not have to be preplanned and can be changed, shortened or extended at any point in time. These models of guiding visitors – which are sometimes mixed together – are often used with a variety of formats of content: chronologies and timelines, spatially-organised information; slideshows offering both highly curated narratives and freedom of choice; archival film; and oral histories. Our own research in Melbourne and elsewhere suggests that apps designed with the human guide model in mind can be successful in situations with a well-defined visitor route. Elsewhere an interactive exhibition model that offers people the opportunity to self-select what objects and artifacts to examine can be more engaging. In either model, reception is influenced by the way information is structured and presented in the guide, and how this mirrors the physical reality. Text is not very popular with visitors while images, film and oral histories are. Chronologically listed information, for example, does not hold people’s attention when confronted with a rich spatial panorama. A powerful approach is to juxtapose archival images and films with views of the present-day reality; a technique used successfully by the ‘Streetmuseum’ app created by the Museum of London. For a long time, research in the social sciences has argued that people’s experience and learning in museums and heritage sites can be enhanced when they talk, discuss and interact with each other. Therefore an unresolved problem for designers is to develop mobile guides that facilitate and encourage social interaction and discussion between visitors. Our experiments with different kinds of app show that people tend to treat the use of the device as a private activity and experience talk with others as disruptive. Future experiments, maybe using larger displays, will show how devices such as tablet computers might be more conducive to social interaction and conversation. A couple of years ago I visited Laurel Riek at the computer-lab in Cambridge. Laurel introduced me to some of the stunning humanoid robots she was experimenting with. One application for those robots, she said, could be homes for the elderly or homes where people live on their own; those robots could keep these ‘singles’ company. At a recent meeting of the Digital Sociology Study Group (British Sociological Association) I met Ciara Garattini (@LifeDeathTech) who runs a blog called Life, Death and Technology. On the blog you’ll find a curious collection of items from a link to a photography collection by David Lynch to a notes on a Seminar on Death at Columbia University. 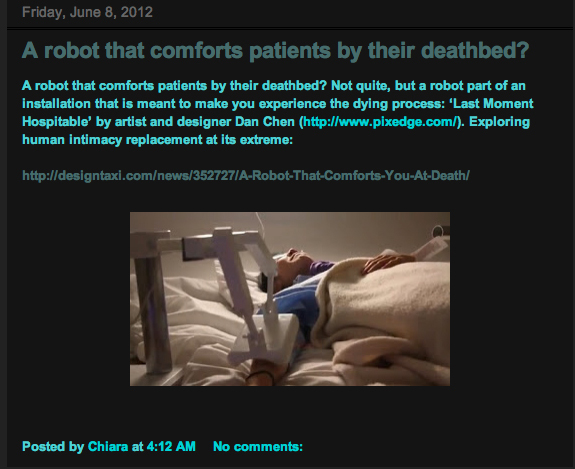 The item that drew my interest was an art installation by Dan Chen, “A Robot that Comforts you at Death’. Like the robots I encountered at the lab in Cambridge this robot is designed to replace human intimacy with technology. Although Chen said he had no plan to commercialise the robot the deployment of these kinds of technologies seems attractive. Related work has been undertaken in robotics, where for example, Kobayashi and colleagues (2011) developed robots “that provide assisted care, such as serving tea to the elderly in care facilities. They (2011) also experimented with a robotic wheelchair that automatically moves alongside the caregiver. The motivation for the development of such a device is to facilitate easy communication between the person sitting in the wheelchair and the caregiver. At the same time, the caregiver who now can walk alongside the moving wheelchair is not so much seen as the person caring for the wheelchair user but as someone who is with the wheelchair user. The development of technologies like the robotic wheelchair demonstrates a growing concern in robotics and human-computer interaction to develop technologies that facilitate and support social interaction between people. Another example for technologies designed to enhance cooperation and interaction can be found in museums. For long, technology designers have focused on enhancing the experience of exhibits for the individual viewer or spectator; examples for such ‘individualising’ technologies are audio-guides and PDAs as well as many touch-screen systems. Fairly recently however, technologies have been deployed and experimented with in museums that facilitate cooperation, interaction and discussion. At the Tate Britain the exhibition of Constables landscape paintings was augmented by a large-scale projection that allowed multiple visitors to real the X-Ray image underneath one of the paintings and discover features that Constable had hidden by painting them over with bushes and treas. In a very way, and this brings us back to the use of robots in museums, Yamazaki and colleagues (2009) deployed a robot in a major art museum in Japan. The robot was designed to draw visitors attention to particular features of a painting and encourage them to examine those features. The robot thereby monitored visitors’ responses to the information it was giving and produce subsequent actions in alignment with the actions of the visitors. We therefore see two parallel development that might be worthwhile observing over the coming years as they might dovetail as robotics and human-computer interaction take further notice of sociological research of the organisation of interaction: first, there is the development of robots, robotic devices and other interfaces that facilitate interaction of individuals with technology. And second, there are developments that attempt to situate technologies like robots, gesture interface, and the like within social situations. These novel systems and devices are designed with particular care to fit in emerging social interaction, rather than interrupting it. Participations is the online Journal devoted to the broad field of audience and reception studies, and has been running for ten years now, to be found at www.participations.org. It aims to bring into dialogue work and debate across all fields involved in examining all areas of media and culture. Participations has pioneered a system of open refereeing for all contributions, designed to encourage open, critical debate among researchers. This has been widely welcomed by contributors to the Journal. New media technologies and digital mediated environments bring histories and events close to audiences by offering a wide range of resources that provide them with opportunities for social, cognitive and emotional participation and engagement. At the heart of the development of new media technologies is “interactivity”, a characteristic ascribed to objects and systems that engage people in ways that go beyond traditional feedback procedures. These technologies facilitate sustained engagement and participation, allow for the communication of information and multimedia content, and often encourage people to produce and curate digital content. Such interactive technologies and environments have become a familiar feature of many cultural institutions, such as in museums, galleries and science centers. Interactive exhibits, immersive installations, digital interactives, virtual games and online platforms engage cultural audiences in new ways and at the same time challenge the concept of the audience per se and their experiences; for example, they invite visitors not only to view and examine curated content but increasingly involve visitors in the production and curation of it to create personal museum collections, user generated content, etc. These technological developments therefore challenge the relationship of audiences with artists, curators, museums and heritage sites’ professionals, educationalists as well as exhibition and interactive designers. Their effectiveness as tool for interpreting and representing exhibits and as educational technology is often argued for but also ever so often challenged and criticized. Evaluations of new media technologies in cultural institutions arrive at contradictory findings, some arguing for their ability to increase people’s engagement and participation with content and exhibits whilst others warn that they distract from the original objects and disturb the sacred relationship between visitor and object, user and content. Indeed, research suggests that at times these technologies become the reason for people’s frustration and disorientation in online and physical environments. This Special Issue will contribute to these discussions about the increasingly complex technological mediation of the relationship between social practices, cultural institutions, their cultural offerings and their audiences. The issue aims to add to debates in a range of disciplines such as audience and visitor studies, marketing, digital humanities, interactive design as well as museum studies and practices. The co-editors invite submissions of papers that investigate the relationships between audience, cultural institutions and content and the ways in which these relationships are being influenced by the increasing pervasiveness of new media technologies. We particularly welcome critical considerations of the concept of the audience and the user as well as of interactivity in cultural institutions and encourage the submission of short articles and reports that reflect professional and practical experience of technology deployed and used in exhibitions. what are the issues of interactivity in relation to participation and engagement for online and offline audiences? how does interactivity and interactive technologies in these settings influence the experience of visitors, audiences or users? which are the elements that constitute and influence these experiences? how are interactive technologies used to represent and interpret information, histories and narratives in cultural institutions? what is the relationship of academic research on audiences, interactive media and professional practices? how does a researcher capture interactive audience experiences? Which are the research methods used in the various disciplines? what does “effectiveness” mean for different stakeholders in cultural institutions, and what are suitable research methods to evaluate, assess or measure the “effectiveness” of technology deployed to interpret cultural objects and enhance people’s experience and learning from these objects? how different users such as specialised audience utilise online material, information and personalised collections? The Special Issue will be constituted of research papers, theoretical and methodological investigations as well as of relevant reviews, short articles and reports by cultural institutions’ professionals, designers and consultants. There are various attempts by science museums to bring to life some of the hidden ways in which the Internet works. When I visited the Science Museum in Chicago about 10 years ago there was an exhibit where I took a photograph of myself that then was transmitted to the other end of the gallery and displayed on a screen; the transmission of the picture was visualised on a wall where small packages moved along to where the screen was. A few months ago in late March the National Media Museum’s Internet Galleries in Bradford opened together with Life Online that pursue a similar goal; making the development and functioning of the Internet intelligible. Now in late July 2012, the Science Museum in London together with Google launched Chrome Weblab, “a series of interactive Chrome Experiments made by Google that bring the extraordinary workings of the internet to life”. The exhibition is in the basement of the Wellcome Wing. When I visited the gallery had just opened to the public and was already heaving with people. Weblab is comprised of five ‘experiments’ people can engage with by using a Lab Tag and the various interfaces and systems displayed in the space. On entering the gallery each visitor can draw a Lab Tag from a computer system that is used as an identifier through which visitors’ engagement with the individual experiments is recorded and made retrievable from home. From here on the route took me into the gallery and a first large screen, the Data Tracer. On entering the gallery I heard musical sounds which apparently came from the centre of the space but I had no idea who or what produced them and why. On closer look I saw a number of machines that looked like musical instruments that made sounds without anybody in particular playing them. I was intrigued but before I got to move to one of those instruments a person at the exhibit in front of me left the computer system and I engaged with the Data Tracer. Data Tracer is comprised of three or four small screens connected to a large display showing a map of the world. On arrival I waited for a few minutes until a small screen become available and then fed my Lab Tag into an interface. I then was confronted with a number of thumbnail images showing objects and photographs of faces; on selecting one of the thumbnails a large copy of the image appeared on the large screen opposite locating the physical place where the image is stored and then drawing lines from there back to the Science Museum; thus, the exhibit visualizes the transformation of the image into data packages and their ‘journey’ to the Science Museum. Like the old exhibit at the Chicago Science Museum this Weblab experiment makes visible the process of using Google search engine. Having experimented with the exhibit for a while by tapping on two or three of the thumbnails I noticed other visitors waiting behind me and moved on to the next experiment, the Sketchbotswhere robots draw faces captured by a webcam of physical visitors in the gallery and online visitors in sand. Only few people stopped for longer than a minute or so at the robots and often moved on when noticing that at the next lot of robots they can have their own faces or those of their children drawn. The process fascinates people. Having taken a picture they observe the robot at work and their image appearing. They take pictures on their cameras or film the process with their mobile phones, commenting on the delicate strokes the machine makes in the sand. People also exploit the possibility to take pictures of others as a means to engage their (small) children with the exhibit who otherwise may not stay with the experiment for long. They lift children up in front of the camera, take the picture of their face and then show them that the robot is drawing that picture of their face in the sand; the activity keeps the children engaged with the exhibit for considerable time. From the robots my visitor journey took me to the Teleporter, an exhibit that uses periscopes connected to the web to look at location around the world pre-determined by the designers. For somebody on their own the use of the periscope can feel a bit strange, as you pull the system in front of your eyes and loose awareness of what is happening around you. Looking through the periscope I saw the inside of an aquarium located in Cape Town and could turn around to get a 360 degrees view of the space. On occasions I pressed a button at the top of the periscope to take a photograph that with the help of the Lab Tag was saved on my account. As I discovered when leaving the periscope on the wall behind the exhibit my picture was displayed on small digital photo frames together with those taken by others. The picture bears a time-stamp and can be discussed with others who had no access to what I was looking at while using the system. One of the potentially most exciting exhibits is the Universal Orchestra, a robotic orchestra made up of eight instruments simultaneously operated by people in the gallery and on the Internet. The instruments are located in the centre of the gallery, each equipped with a computer system that people can use to create sounds. You touch different notes on the screen, the information is fed to the robot that then creates the sound. Arriving here helped explain the soundscape I had been hearing on entering the gallery. As with some of the other exhibits I was a secondary user of the exhibit, experiencing how to use the systems and what they do before I gained access to one of the instruments. The interaction with the system kept me busy for a while, as I tried to figure out how my actions on the computer screen relate to the sounds made by instruments. Also, the exhibit is described as a “real-time collaboration with people across the world” but because it is difficult to make out who creates what sound the use of the notion of “collaboration” to describe the events is problematic. Finally, I went to a workstation where the Lab Tag is used to retrieve information about the activities a visitor has engaged with during their visit to the Weblab. The Lab Tag is slotted into the system and the computer screen shows what exhibits the visitor has been at and what they have accomplished there; for example, the photograph taken with the periscope or the sounds produced as part of the Universal Orchestra can be revisited. Seeing on the screen what I had done and what I had missed doing encouraged me to return to the gallery and conduct some further experiments with the Universal Orchestra before then leaving the exhibition. Having arrived back home I booted my computer to visit the Online Chrome Weblab. I typed in the web address given on the back of the Lab Tag, scanned in the tag and immediately arrived at my Lab Report. The site shows my activities in the galleries on at the Science Museum, and allowed me to conduct the same experiments online. When opening for example, Online Sketchrobot, a site opens that shows live footage from the gallery before opening a screen that looks very similar to the one in the gallery. I took a picture of myself which then was processed ready for the robot to draw in the sand. I then typed in my email address through which the system later notified me that the robot had completed its job. The other exhibits work in a similar way. The Online Data Tracer invites visitors to ask the system to use for a physical location of an image file. I typed n my Twitter handle and the system located the associated picture in Isenburg, a small city in the German federal state of Hesse. TheOnline Teleporter allows the user to click on an image and obtain a live view into the bakery in North Carolina, the miniature exhibition in Hamburg and the aquarium in Cape Town. And the Online Universal Orchestra facilitates access to the eight instruments; one can view events in the gallery and play the instruments in the gallery from a remote location, audible to visitors in the museum and remotely. The played music can be recorded and then like the activities at the other exhibits, is retrievable from the Online Lab Tag Explorer. Chrome Weblab is a fascinating experiment of an exhibition. It tries to make intelligible that the Internet connects remote locations on the planet. And this connectedness involves much more than the accessibility of information through search engines and web browsers but also allows for the possibility to act and interact with machines and people across the world in real-time. The exhibition invites visitors to engage and participate with exhibits in the gallery and remotely and discover for themselves the relationship between the Internet and the social world in the gallery and remotely. It is successful in engaging people for considerable time with the topic of the Internet and creates an awareness for the connected world we are now living in; robots can be operated remotely, people in remote locations can “collaboratetively” make music, we can have a peek into the world of others from remote locations. Over the past 10 years or so I had the opportunity to study visitors participating with technology in museums, including the Science Museum and the Wellcome Wing. Therefore, for me visiting Chrome Weblab was interesting also to see how features of exhibits in Who am I? and Digitopolishave been further developed by the design team of Chrome Weblab. For example, the replacement of the flaky fingerprinting mechanism to save visitors’ activities with exhibit on a server by the physical Lab Tag is a huge improvement. The tag works well and without problems with webcams at home (and at work) and also is a nice memorabilia from the visit. However I could imagine that in the future the Lab Tag is transferred to a mobile phone as people tend to loose or forget about items they take away from visits to museums. Also, the taking of photographs of people’s faces that has been a critical feature of exhibits in Who am I? has been improved. The interface is much more flexible and adaptable to use pictures visitors take. There are three aspects of the exhibition that I believe might be worthwhile exploring further for the design team and google when revising the galleries. First, I think the key message of Weblab, i.e. the interconnectedness, is not coming through clearly enough. The relationship between people’s action in the gallery and remotely need to be made more intelligible and obvious. For example, at the moment it is unclear who plays what note at the instruments of the Universal Orchestra; at Data Tracer the actions on the small screens could be made visible, and at Sketchrobot more needs to be done to make the activities by the remote participant visible to give this part of the exhibit more prominence in the gallery. Second, as the gallery is described as a laboratory the design team and their research staff might use it not only as a laboratory to experiment with technology but also as a space where they can experiment with human behaviour in technology-rich spaces. For example, it has been a common problem for museums that display a large number of computer-based exhibits that the number of interfaces is often much lower than the number of visitors who wish to participate with the exhibits at any one time. This leads to long waiting-times and queues at exhibits, people being secondary users rather than experiencing exhibits first hand, and unfortunately also people leaving disappointed because they did not get a chance to use an exhibit first-hand. Being setup as an experimental space the gallery would allow the design team to experiment with different ways to manage the flow in the galleries and to mange access to exhibits. And third and maybe most importantly, considering that many visitors come with friends and family the design team could use the space to experiment with the provision of resources that facilitate and encourage collaboration at computer-based exhibits. The observations at the Sketchrobots where parents provide their children with access to the exhibit illustrate that visitors are interested in experiencing the exhibits together, yet the interfaces often prioritise individual users over collaboration. It would be fascinating to see experiments with novel interfaces that encourage visitors to collaborate with others in the gallery, and also with people in remote locations. Heath, C., & vom Lehn, D. (2008). Configuring Interactivity: Enhancing Engagement in Science Centres and Museums. Social Studies of Science, 38(1), 63-91. Heath, C., & vom Lehn, D. (2004). Configuring Reception: (Dis-)Regarding the “Spectator” in Museums and Galleries. Theory, Culture & Society, 21(6), 43-65. Heath, C., Luff, P., vom Lehn, D., Hindmarsh, J., & Cleverly, J. (2002). Crafting participation: designing ecologies, configuring experience. Visual Communication, 1(1), 9-33. Hindmarsh, J., Heath, C., vom Lehn, D., & Cleverly, J. (2005). Creating Assemblies in Public Environments: Social interaction, interactive exhibits and CSCW. Journal of Computer Supported Collaborative Work (JCSCW), 14(1), 1-41.
vom Lehn, D., Hindmarsh, J., Luff, P., & Heath, C. (2007). Engaging constable: revealing art with new technology. Proceedings of the SIGCHI conference on HumanComputer Interaction (pp. 1485-1494). San Jose,CA: ACM Press. vom Lehn, D. (2010). Generating experience from ordinary activity: new technology and the museum experience. In D. O’Reilly & F. Kerrigan (Eds. ), Marketing the Arts. A fresh approach (pp. 104-120). Abingdon: Routledge. vom Lehn, D., & Heath, C. (2005). Accounting for new technology in museum exhibitions.International Journal of Arts Management, 7(6), 11-21.
vom Lehn, D., Heath, C., & Hindmarsh, J. (2001). Exhibiting interaction: Conduct and collaboration in museums and galleries. Symbolic Interaction, 24(2), 189–216. Ilicco Elia, Head of Consumer Mobile, Reuters Media, gave a lecture as part of my module “Marketing and New Technologies” (MSc International Marketing) at King’s College London. Ilicco who has been working at Reuters since 1993 and at Reuters Mobile for the past 6 years, highlighted the increasing difficulty for media companies to retain their integrity whilst reporting news as they emerge. Reuters are a news agency that over the decades has built up an image and a brand that stands for trust and integrity in news reporting. It now is confronted with the pressure that their customers Reuters to deliver up-to-date accurate information about events as and when they happen. Therefore, Reuters use about 2500 journalists to gather, edit and disseminate news to a global audience. These journalists use mobile technology, including networked high-end cameras, camera phones, mobile phones, laptops, etc, to gather information (pictures, videos, text, …) and immediately send it to the editor in the London office who produces news items that are disseminated across the various Reuters distribution channels. Illico illustrated the process by referring to the Football World Cup 2010 when pictures taken by journalists in South Africa appeared on Reuters mobile seconds after they had been taken. On the next day, the same pictures were published in newspapers around the world. The immediacy that people increasingly demand from news organisations is driven by the growing pervasiveness of consumer mobile technology, such as mobile telephones, laptops and tablet computers. It is not sufficient anymore that Reuters disseminate news via its website but they have to develop applications, ‘apps’, that run on a range of different mobile devices and systems. Based on the opportunities offered by the iPhone and Blackberry phones Reuters created applications that deliver news through different kinds of mobile device. For example, Reuters New Pro, Reuters Mobile Website and Reuters RSS deliver global news to customers who are on the move; and Reuters Galleries exhibit the best photographs taken by Reuters correspondents around the word. Ilicco highlighted the profound changes to journalism that have been initated by the wide distribution of mobile technology to consumers. It not only influences the consumption of news, everywhere and at any time but also the organisation of news production, editing and disemination. The scope of these changes is just becoming visible in the editorial offices but little is known of the emerging practices of news consumption. The new technologies also facilitate new forms of journalism. In recent years, citizen journalism and the contribution of news by consumers in others ways has become more and more popular with many news organisations. This seems to be a dangerous path for organisations like Reuters that have built their brand on the integrity and authenticity of their news. News and information delivered by people other than Reuter’s journalists are difficult to assess in their truthfulness and authenticity. Similar, it can sometimes be difficult for news organisations to hold on and evaluate information before disseminating it, as competitors may push forward with the distribution of an item. Examples of the speedy dissemination of wrongful news are manifold. The Guardian for example pressed forward with repeatedly reporting that Nokia Smartphones would soon be running Google’s Android operating system. As we now know Nokia have entered a close collaboration with Microsoft, rather than Google. The ease of diseminating news is a tempting for news organisations as for mobile users. By clicking on a few buttons a news item with (maybe incorrect) information, can be shared with friends and followers on social networks. The sharing of wrong news by mobile users can badly reflect on their image in the ‘twitterverse’. As Rob Wilmot highlighted in an earlier guest lecture in the same module in January, ‘trust’ is difficult to gain but easily lost in social media. And this valid for businesses and organisation as well as for individuals.